Parent-Child Interaction Therapy (PCIT) is an evidence-based treatment program for children with emotional and behavioral problems and their parents. The program aims to improve the quality of the parent-child relationship, and to change parent-child interactionpatterns. As a result, both the child’s behavioral problems and parents’ stress level are reduced. To start, parents in this treatment program learn more about the relationship enhancement and discipline skills that they will be practicing in therapy sessions in an observation lab and at home with their child. PCIT includes a combination of play therapy and behavioral therapy. PCIT helps improve family dynamics by working to reduce negative behavior and interactions, and to practice new behaviors and ways of communicating that are more encouraging and reassuring. When practiced consistently, these new skills and techniques can instill more confidence, reduce anger and aggression, and encourage better individual and interactive behavior in both parent and child. Early in life, children are not capable of filling out a complete questionnaire or talking to an interviewer. In that case, observing behavior can provide valuable information in combination with parental interviews. 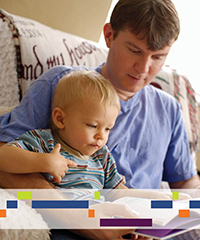 Several of our customers have focused their research on parent-child interactions. They performed their studies in either a laboratory setting or a natural setting, such as a family home, to measure the behavior of the parents and their children. In both settings, the researchers recorded the interactions on video and coded behaviors in detail. By using video recordings, researchers did not lose any information and were able to replay the same scene as often as needed. An observation lab is designed to allow you to observe your test participants unobtrusively, in an environment similar to your test participant’s natural surroundings. To get off to a good start, it is best to describe the research or tests in great detail. Download this free ‘how to’ guide to learn more about building an observation lab. For example, Lisa Edelson and colleagues from the Nestlé Research Center in Sweden studied how parents’ prompts to eat fruits and vegetables relate to children’s intake of these foods. The research team studied videos taken in an in-home setting. By using portable recording devices, the researchers were able to observe the parent-child interactions in natural settings without the disruptive influence of having observers physically present in the room. The study showed that parents who gave neutral prompts such as ‘eat your peas’ or ‘try your hot dog’ with a neutral or positive tone of voice were most successful. The key to successful interventions is the use of modifiable parenting practices. In the randomized controlled study by Montaño et al., researchers examined the relationship between positive behavior support (PBS) and dietary quality of the meals served to children between the ages of two and five years old, a critical period for the development of a dietary lifestyle. Part of the study consisted of observing parent-child interaction while carrying out various tasks, including free play and cleaning up, followed by meal preparation. The main purpose of the study was assessing parenting behavior. Researchers at the University of Wisconsin-Madison, USA, conducted a study to explore the frequency and characterize the purpose of props used during mealtimes with children with autism. Props are items that support child participation during mealtime, such as toys, typically child-friendly items, or common household objects. Mealtime videos were uploaded into The Observer XT. Hereby, coders were able to review, visualize, and independently code observational data in the coding software. The study showed that props such as toys could help to calm a child and provide comfort, or support the child’s focus. In some families, props were also used as a reward to reinforce positive eating or mealtime behavior. The need to observe parent-child interactions in natural settings has been stressed by many researchers. An exhibit designed specifically for children is therefore ideal as a research setting. The team from Loyola University in Chicago chose a museum as the setting for their experimental and observational research. They examined the effects of parent-child conversation and object manipulation on children’s learning, transfer of knowledge, and memory of the exhibit. The invention resulted in more parent-child joint talk. Although children can learn a great deal on their own, conversations with parents have a big influence on the content, recall, and transfer of what they learn. In this blog post, I have highlighted a number of studies conducted by some of our customers. These studies focused mostly on mealtime behaviors. If you are interested in reading more or about different topics, please have a look at our Behavioral Research Blog, or find some interesting publications in the list below. Dishion, T.J.; Mun, C.J. ; Drake, E.C. ; Tein, J.Y. ; Shaw, D.S. & Wilson, M. (2015). A transactional approach to preventing early childhood neglect: The Family Check-Up as a public health strategy. Development and Psychopathology, 27, 1647-1660. Talbott, M.R. ; Nelson, C.A. ; Tager-Flusberg, H. (2013). Maternal Gesture Use and Language Development in Infant Siblings of Children with Autism Spectrum Disorder. Journal of autism and developmental disorders, 1-11. Thomassin, K.; Suveg, C. (2014). Reciprocal positive affect and well- regulated, adjusted children: A unique contribution of fathers. Parenting: Science and Practice, 14 (1), 28-46. Weisman, O.; Zagoory-Sharon, O.; Feldman, R. (2014). Oxytocin administration, salivary testosterone, and father-infant social behavior. Progress in Neuro-Psychopharmacology & Biological Psychiatry, 49, 47-52.